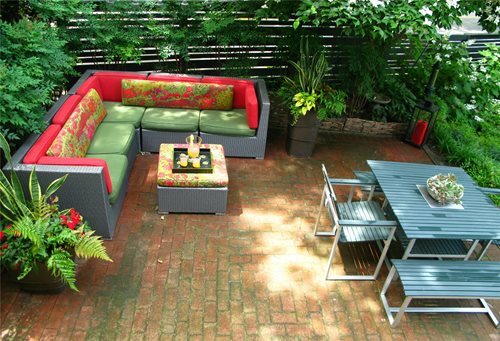 Brick has been used as a paving material for many years. Some historians even believe that the production and use of bricks dates as far back as Ancient Mesopotamia. While these first bricks may not have been what we are familiar with today, Kyle Ritchey of Milieu Design in Wheeling, IL points out that clay bricks have been largely unchanged in the past few centuries. “They pretty much got it right the first time,” he says. 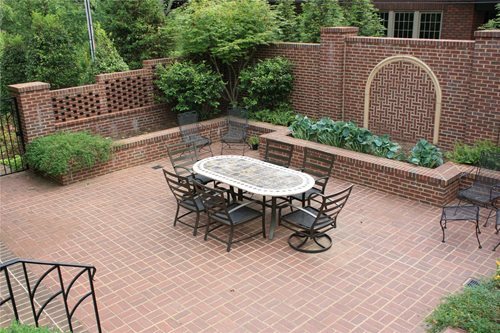 Brick is a time-honored material for paving patios, walkways, driveways and more. 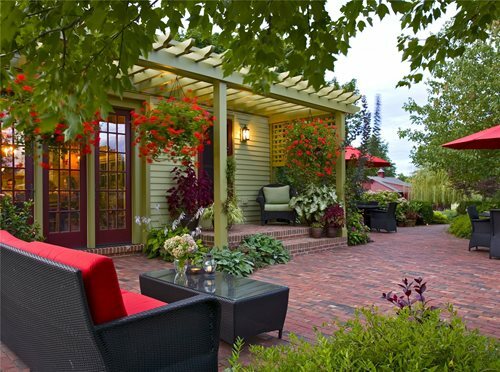 Red and used brick are the most common types used for residential hardscaping. Traditional bricks are made from clay that has been fired in the shape of a rectangular block. The average measurements of a brick are 4 inches by 8 inches by 2 ¼ inches, which is just about the right size and weight for a mason to handle using one hand. 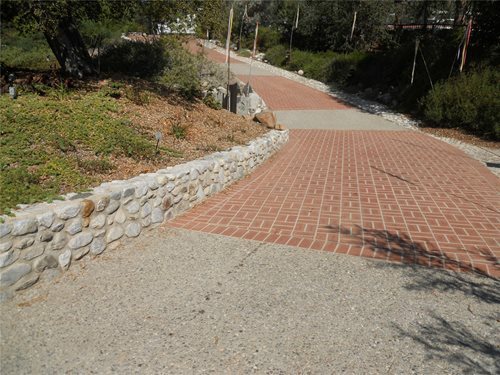 Brick paving has a custom look because it is laid by hand, one block at a time. Intricate patterns can be created by cutting bricks and laying them in a special fashion. When installed properly, bricks will last for many years. The main maintenance concerns include making sure that moss does not grow on the surface of the bricks and repairing any bricks that sink or shift. 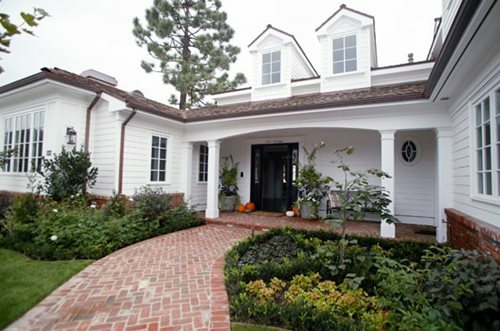 Many homeowners are drawn to brick because of its distinctive color. Since the color penetrates the entire brick, fading and wearing away of the color are never a concern. 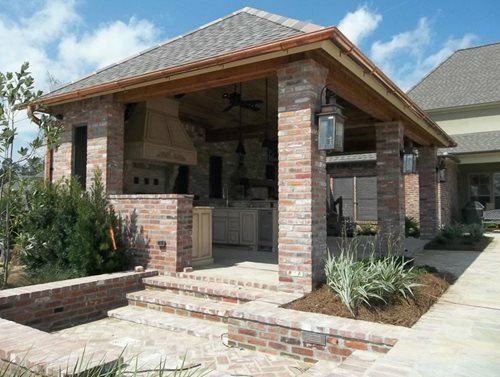 Brick is popular for traditional and historical style homes, but can be adapted for use in more contemporary settings. 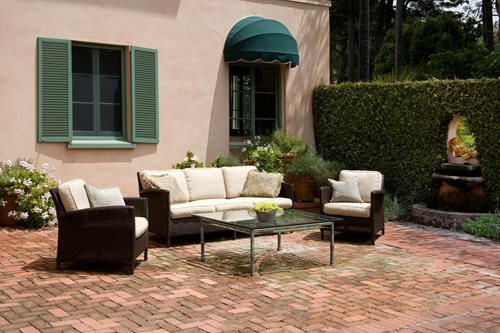 Both Margie Grace of Grace Design Associates in Santa Barbara, CA and Kyle Ritchey of Milieu Design in Wheeling, IL agree that brick is the ideal paving material for those wanting to create an established and authentic look. However, they also point out that this rule can be broken. Ritchey suggests creating steppers out of brick for a more modern application. Grace says she doesn’t limit her use of brick to one architectural style. She has used brick in traditional, modern and Mediterranean landscapes. Once you’ve decided on brick as your material of choice you will have to make a number of decisions. First you should plan where your new paving feature will be installed and how large it will be. Next, you will need to determine which installation method will be used: dry laid or mortared. Then, you will need to select a brick type and color. Finally, you must choose a pattern or design for the brick layer to create. 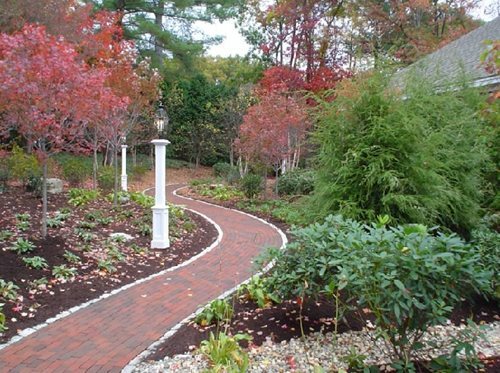 A professional landscape contractor or designer will help walk you through this process and guide you to make educated decisions. Use the resources in this guide to get a basic understanding of brick paving and to begin planning your project.